Freshman Tatem Levins drove in five runs on the afternoon to pace the La Salle offense in a 19-9 non-conference win on Wednesday over Fairleigh Dickinson at Hank DeVincent Field. Tatem, along with Ben Faso, Ross Mulhall, and Quentin Brown each homered in the winning effort. Brown finished with four RBIs, Faso with three. The win improved the Explorers to 12-8 on the season. The club travels to open the Atlantic-10 conference schedule on Friday with a three-game set against Davidson. Saint Joseph's 5, Bucknell 4: Freshman Nate Thomas capped a three-run eighth inning with a two-run blast that proved to be the difference maker. He finished with two of the Hawks' seven hits on the afternoon. Ryan Devine tossed two scoreless innings in relief to secure the save, his third of the season. Swarthmore 4, New Jersey City 3: Holden Bridge and Sam Jacobson each collected two hits for the Garnet in the win. Jacobson also drove in a pair while Charles Levitt finished 1-for-3 with an RBI. Charles Groppe secured the win despite surrendering two runs over four innings while allowing eight hits. Ursinus 14, Delaware Valley 3: Zakary Zgura drove in two of the three Aggies' runs with a two-run single in the eighth. Cairn 9, Eastern 5: Caleb Edman finished 2-for-3 to lead the offense. Brett Marks and Alejandro Fernandez each chipped in with two hits apiece. Eric Stinglen recorded the win, tossing three scoreless innings while surrendering just one hit. 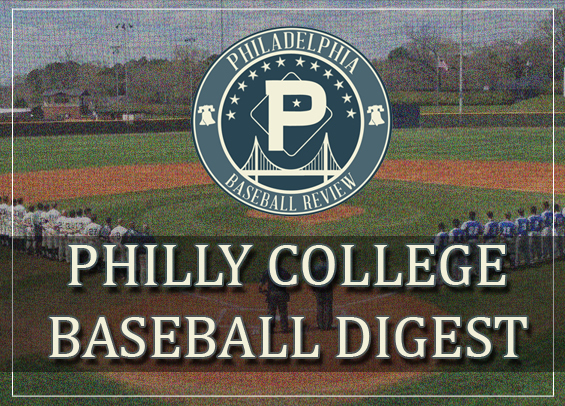 Widener 3, Haverford 2: Dylan Morrissette collected three hits for the Pride while Kyle Laing and Dylan Peiffer combined to toss four scoreless innings in relief. Neumann 8, Penn State Abington 7: Curt Yenchik drove in the winning run with a single in the eighth inning to lift the Knights to the win. John Lindeborn chipped in with two hits and a pair of RBIs. Joe Rizzo finished with three hits for the Nittany Lions. Tyler Dipatri homered and drove in a pair. Arcadia 16, Scranton 11: The Knights erupted for 20 hits on the day with Bryan Gillen leading the way with a 4-for-5 performance with five RBIs. Dylan Towey and Sean Carew each homered in the winning effort.